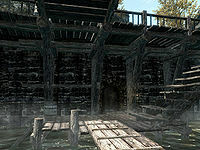 Romlyn Dreth's House is a dwelling in the lower part of Riften, by the canal that runs through the city. It is found next to the stairs leading down to the canal from in front of Honorhall Orphanage. Just to the left of the entrance are two fish barrels that you are free to take from. It is a single room dwelling, like all the homes all the canal-side with a partial wall separating the living and sleeping quarters. 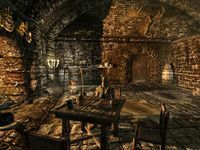 Upon entering you are in the living area that consists of a fireplace in the middle of the west wall, with a garlic braid, a bunch of elves ear and two bunches of frost mirraim hanging above. Located in the northwest corner is a cooking pot and a piece of firewood. Situated in front of the fireplace are three chairs and a round wooden table holding a bottle of alto wine and a salmon steak. There is a dresser holding lavender against the partial east wall and hanging above it are three rabbits, a pheasant, two garlic braids and a bunch of elves ear. There are a set of shelves and an unlocked chest against the south wall. The shelves are holding a potion of minor healing, a potion of minor stamina, a cabbage, several potatoes, a bottle of wine, a bottle of Nord mead, a couple of loaves of bread and several pieces of cheese. Barrels and sacks containing foodstuffs are situated all around this room as well. The sleeping area consists of a single owned bed in the northwest corner, with a medium coin purse under it and on the west wall a wall shelf over the bed. On the shelf is a bottle of alto wine. Further along the west wall by the foot of the bed is an end table holding a wooden bowl containing red apples and to the right of the bed against the south wall is a wardrobe containing clothes. There is a Loot shadowmark to the right of the entrance door.